So, you have an ambition to be heavily tattooed? You think maybe a sleeve is right for you . 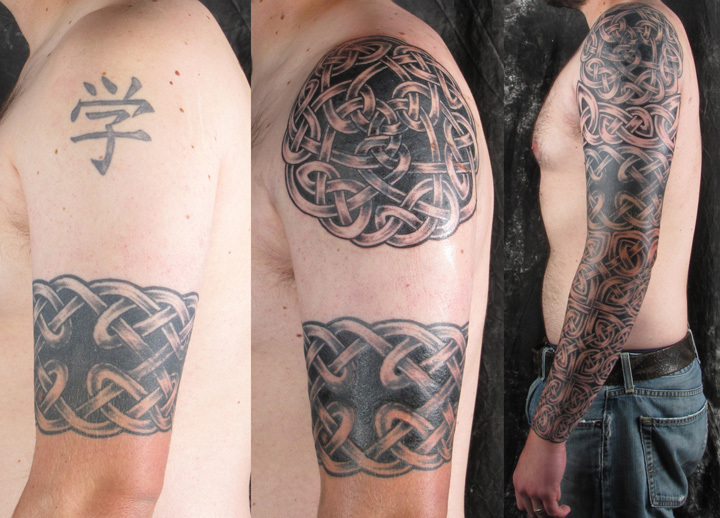 . . maybe even a Celtic knotwork sleeve . . . ? You've come to the right place! This page has examples and information about the process of building a sleeve in several parts over time. A complete wrap (forearm or lower leg) or a half sleeve can be designed all at once and installed over several sessions, each a month apart. But often people do not feel ready to begin with that degree of commitment. To build a sleeve over time, it can be built by choosing elements individually, and adding to it when you are ready. If you can't make it to Santa Barbara very often, it is often best to proceed so that the work looks finished at any stage, and it is added to when you can. If you already have an existing tattoo that you want to incorporate into a sleeve, then this page is also for you. Each of the half sleeves that you see here started as an individual stand alone tattoo, and these photos document the transformation into a full coverage piece. Throughout, you will see links to my LuckyFish Art tattoo design store, where both individual elements and whole sleeves are for sale as flash. An illuminated letter evolves into a half-sleeve tattoo. The half sleeve above began as a large Illuminated Letter tattooed on this client's upper arm. He enjoyed that for several years before deciding to expand. When he returned, we added a Celtic Knotwork Crescent above on his shoulder, and a Band below it. In the third session, a custom piece was added to the inside of the arm, above the band, to fill the remaining space around the letter, and a dotted background was added to tie everything together. Here is another example of a client coming back to turn what was a complete piece into a larger project. The original tattoo is the Defender Band, and it was put on several years prior to the upper piece. A custom cap with a complimentary looping structure and line thickness was designed to sit on top of the band and fill the entire upper arm. 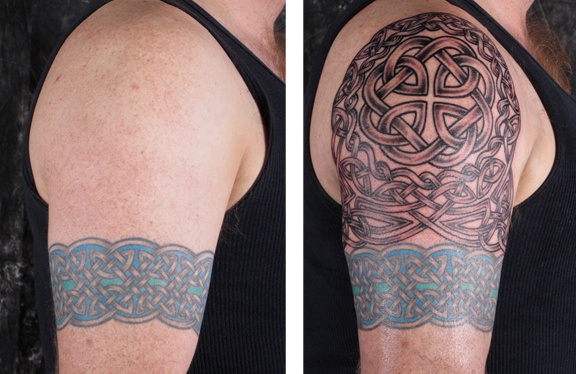 This Celtic Knotwork Full Sleeve Tattoo began with covering up a couple of old tattoos. Both the band and the circular "Honor Knot" were installed as coverups (two separate sessions). 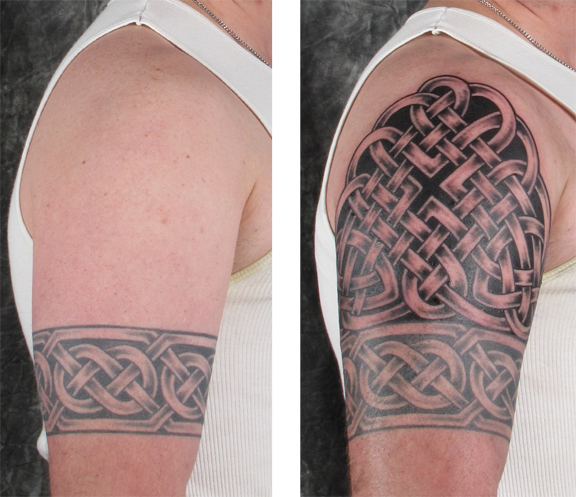 Later, the client commissioned a complete forearm knotwork sleeve, from the wrist to the bottom of the band (two more full day sessions). Finally, a custom wedge of knotwork was designed to tie the upper pieces together (a fifth session). The bold scale of the knots along with the consistent black background really give the impression of a cohesive piece of permanent body armor. Here again, the band came first years earlier. In this case, it is the Tartan Band. The sleeve cap was designed so that a separate knot could be featured in the center; this one is the Father Knot. The pattern for the entire piece is available as the Fatherhood Sleeve. This client knew at the beginning that he wanted a complete coverage half sleeve, which was then built in pieces over three sessions. A great thing about doing it this way is that the tattoo looks finished and complete on its own at the end of every session. First came the large Triquetra at the top of the arm. It was an obvious choice to get this pattern in on the upper arm surface, taking advantage of the rounded musculature, as big as it could be fitted. The second session saw the addition of a cap going up the shoulder along with a dotted background. The two pieces together became The Trinity Quarter Sleeve. In the third and final session, a large band, designed specifically for this purpose, was snugged up to the bottom edge, taking the tattoo down to the elbow and becoming the Trinity Half Sleeve. Below is another example of a sleeve that started with a standalone shoulder tattoo. 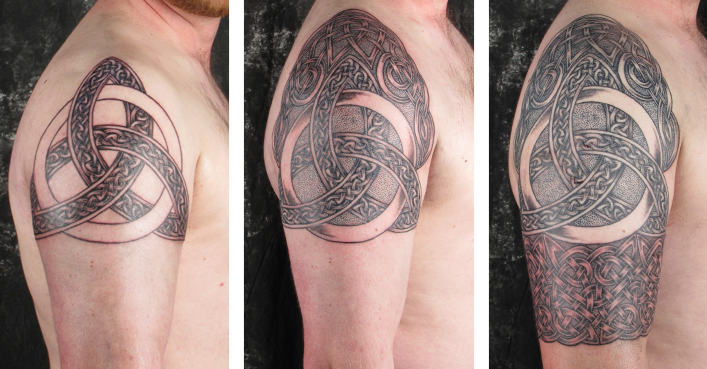 In this case, a pattern of large celtic knotwork was made custom to fit the arm, and then applied up to the edges of the existing tattoo, appearing to continue underneath it. The same client got a similar sleeve on the other arm. The knotwork background matches on both sides, but the right arm features a winged lion from the Book of Kells on top of it instead of spirals. The pair of them makes a dramatic impression indeed! 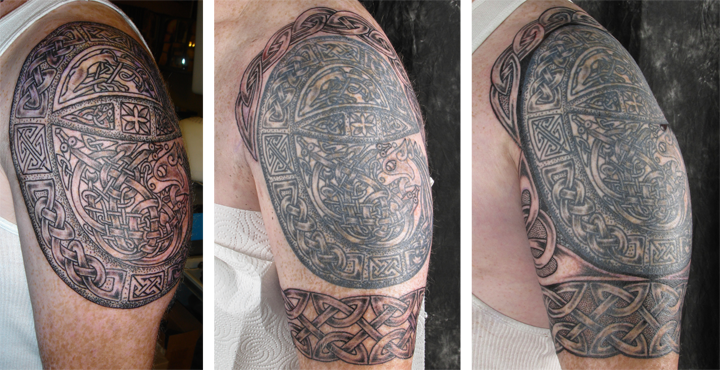 Finally, if you are interested in a complete knotwork sleeve for your forearm, you can visit the WRAPS, SLEEVES, and ARMOR PAGE to learn how such a piece is accomplished.